MIWAHu is the diminutive for Miwahïmoon meaning “natural product which promotes wellness and brings energy”. 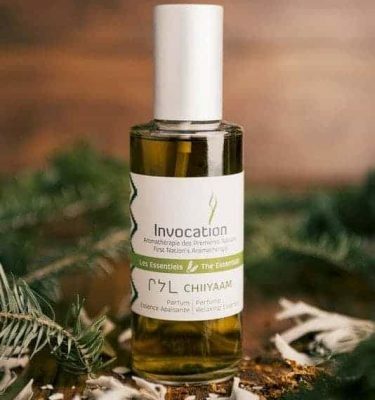 This Native Essence is more feminine than CHIIYAAM; it’s a great partner for everyday life as it stimulates creativity and enthusiasm, attracting beneficial energies and favorable circumstances. Because of its revitalizing effects, the fragrance is used and appreciated by men as well as women. It’s Michel Roudnitska’s expertise that contributed to the conception of MIWAHu. He worked with Blue Eagle whose intention was to make a more feminine perfume than CHIIYAAM. The new fragrance had to produce different energizing effects. 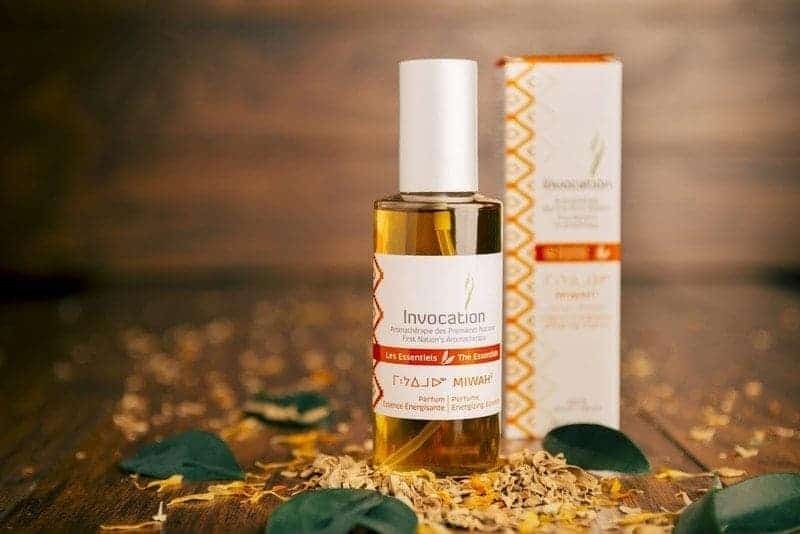 Sweet grass, the most feminine of First Nation’s sacred herbs, also called the hair of Mother Earth as it is often braided, was traditionally used to attract beneficial energies and favorable circumstances; it has been chosen as plant base for this Native Essence. The development of the fragrance lasted twenty months. Blue Eagle worked on the last steps of the perfume’s creation to make sure of the precise potentiality of the ingredients, according to aboriginal ancestral herbal tradition. This Native Essence is very feminine and works gently, for many hours. The MIWAHu perfume releases a very sweet note. It makes for a exalting, joyful, persistent and gentle perfume. It’s made with 22 essential oils, with a sweetgrass dominante. This combination of plant extracts creates an odorant synergy that unfolds in time, like music. The first note (head note), of bergamot and mandarin is light; it’s the one that promotes enthusiasm and creativity. The second note (heart note), of clary sage and vetiver is richer and floral; it encourages beneficial energies to stay and to lay down roots. The third note (base note), because it is deep, with heavy essential oils last for a long time; it is made of sweetgrass, oakmoss, cist and vanilla. As all Invocation products, MIWAHu is handcrafted, in small quantities, through a fourteen month process. Without any preservatives or synthetic fragrances, it’s made of 100% natural ingredients, organic at more than 88% and from an environmental respectful wildcrafting. Here is the complete list of the ingredients: Alcohol, Water, Green Mandarin, Bergamot, Natural Linalool, Cistus, Lemon, Sweet Grass, Natural Nerol, Benjoin resin, Lavander, Rosemary, Tonka Bean, Juniper, Orange, Basilic, Petit Grain Bigarade, Clove, Vanilla, Vetiver, Oakmoss, Peppermint, Natural Anisaldehyde, Clary Sage. 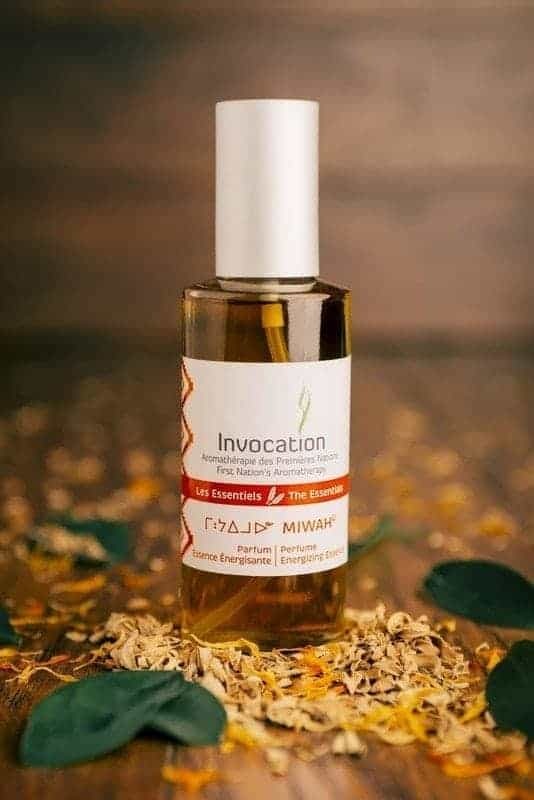 Unlike CHIIYAAM’s composition, where most of the plants were selected for their therapeutic properties, MIWAHu‘s composition comes from plants selected for their olfactory contribution. It results in a perfume that holds well on the skin, with a delicate and charming fragrance. The recommended use of MIWAHu, after using CHIIYAAM, is intended to maximize the benefits resulting from the combination of these two aromatherapy products. It’s also possible to use them separately. When we use them together, we first spray Chiiyaam because it works quickly purifying energies and dissipating heaviness. As it quickly dissipates, ideally fifteen minutes later, we spray on MIWAHu to promote vitality, enthusiasm and creativity, which are its fundamental characteristics. 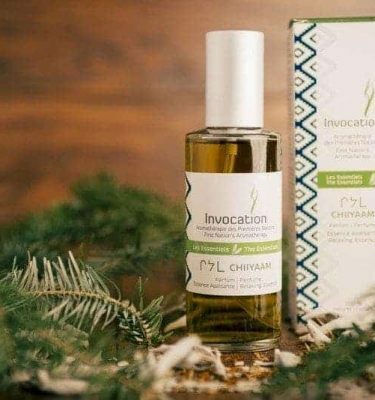 The effect will be more progressive than Chiiyaam but, worn on the skin or a piece of fabric, this Native Essence will develop its fragrance throughout the day. The best way to use MIWAHu is as a perfume. We spray it on the wrists and neck, and its beneficial energy will be felt for hours to come. This fragrance allows allows you to wear a natural healthy perfume! These following sizes are available: spray bottles in 15 ml, 29 ml or 120 ml, or 100 ml dropper bottle refill. Also available with the other perfumes in 10ml in the discovery kit. Alcohol*, Aqua, Citrus aurantium bergamia, Linalool, Citrus reticulata, Citrus limon, Hierochloe odorata*, Nerol, Styrax benzoin, Lavandula intermedia, Rosmarinus officinalis*, Dipteryx odorata bean, Juniperus virginiana, Citrus aurantium amara, Ocimum basilicum, Cistus ladaniferus, Eugenia caryophyllus, Vanilla planifolia, Vetiveria zizanoides, Evernia prunastri, Mentha spicata, Anisaldehyde, Salvia sclarea. Complementary product to the perfume CHIIYAAM. Benefits maximized when you use both. Use CHIIYAAM first, wait 15 minutes before you apply MIWAHu. Spray MIWAHu on your wrists,your neck or both.